Georgian Dublin is synonymous with a period of unprecedented expansion in the market for luxury goods. At a time when new commodities, novel technologies and fashionable imports seduced elite society, silver enjoyed an established association with gentility and prestige. Earlier studies have focused predominantly on the issue of style. This book considers the demand for silver goods in Georgian Ireland from the perspectives of makers, retailers and consumers. It discusses the practical and symbolic uses of silverware, interpreted through contemporary guild accounts, inventories, trade ephemera and culinary manuscripts. For the first time the activities of Dublin's goldsmiths and their customers are considered in the context of the British Isles, acknowledging Dublin's 'second city' status in relation to London. How did the availability of new products like English porcelain and Sheffield Plate affect the demand for silver in Dublin, and how did silver imports from London affect the Dublin trade? To what extent do the practices of Dublin goldsmiths mirror their North American counterparts seeking to infer associations with the fashionable metropolis of London? Drawing on an extensive range of documentary and object evidence this wide-ranging analysis considers the context in which silver goods were made, used, valued and displayed in Georgian Ireland. "This comprehensive study in Taylor & Francis’s Histories of Material Culture and Collecting 1700-1950 series combines recent scholarship with new research and places the achievements of Dublin goldsmiths in a wider international context." "This ground-breaking work provides a fresh and exciting new perspective on the history of eighteenth-century Irish silver. ...Based on meticulous research, this study uses a wealth of documentary and artefactual evidence and draws on the most current international scholarship. It complements the established tradition of connoisseurship in Irish silver studies, and makes eminently accessible a topic that was once decidedly more niche. Exceptionally well informed and highly readable, this study takes its rightful place as a key point of reference in Irish silver studies." 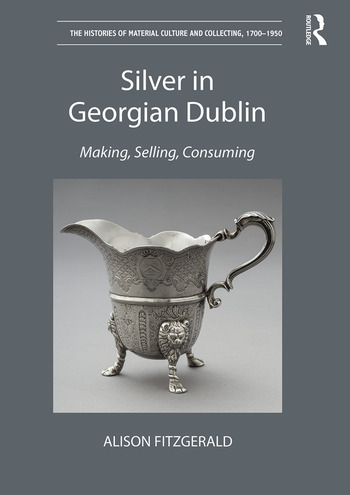 'This study of the making, buying and uses of silver in eighteenth-century Dublin breaks much new ground. It moves away from rarefied connoisseurship, to place silver objects firmly in their economic, social and cultural contexts. While showing what was distinctive about the Irish products, it places them authoritatively in wider worlds of fashionable consumption among the polite and would-be polite. Also, it emphasizes the ease with which styles current in continental Europe and Britain, and found in ceramics, decor and furnishings, could be adapted to silver. Alison FitzGerald’s accomplished and accessible book immediately takes its place as one of the most notable in the gradually expanding literature on the applied and decorative arts in Ireland." "Alison FitzGerald’s excellent new volume on the making and marketing of silver in Georgian Dublin is at once an eminently readable socioeconomic history and a major contribution to the scholarly literature. Building on the enlightening work of recent silver scholars and social historians who have deconstructed the trade and reconstructed the processes, FitzGerald has combed a wealth of primary sources to produce a compelling, clearly integrated, and exceptionally informative study." "Alison FitzGerald’s Silver in Georgian Dublin transforms the way we think about the eighteenth-century decorative arts, both in Ireland and beyond. It explores the whole range of silver objects made, sold and used in Ireland, from the finest dinner services to humble teaspoons. It compares Dublin goldsmiths to their counterparts across the eighteenth-century Atlantic world, in London, Philadelphia and Boston. In the process, it raises challenging questions about the Irishness of eighteenth-century Irish silver. Grounded in a comprehensive assessment of surviving objects and manuscripts, its analysis draws on the most up-to-date international scholarship. Silver in Georgian Dublin is a pathbreaking book. It will cement Alison FitzGerald’s reputation as a leading expert on Irish design and decorative art."